The ‘Forest of Lamps’ at the Mori Building Digital Art Museum in Tokyo. Inside the Mori Building Digital Art Museum. Touch, please. What is being billed as the world’s first all-digital museum is part art gallery, part amusement park and for some, part haunted house. Some things typically found in an art museum are missing: There are no guide maps, no descriptions, and no signs warning viewers to keep their hands off the art work. In fact, there are no works of art — in the usual sense of paintings or objects behind glass cases. 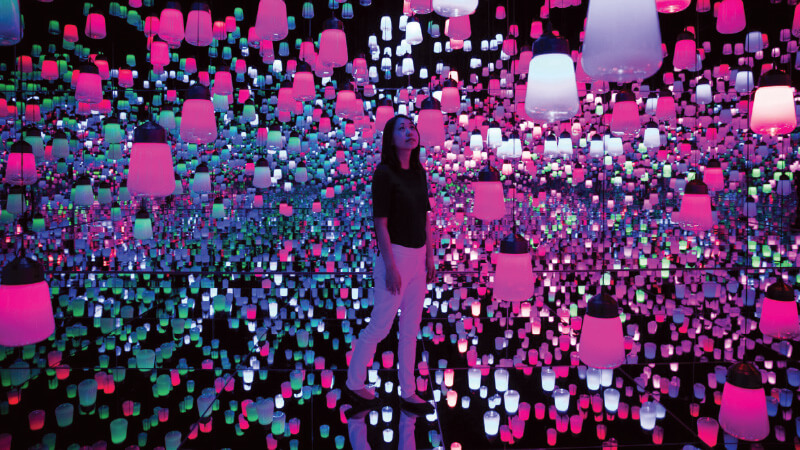 At the Mori Building Digital Art Museum in Tokyo, a collaboration between the developer and art collective TeamLab, light and space equals the art. 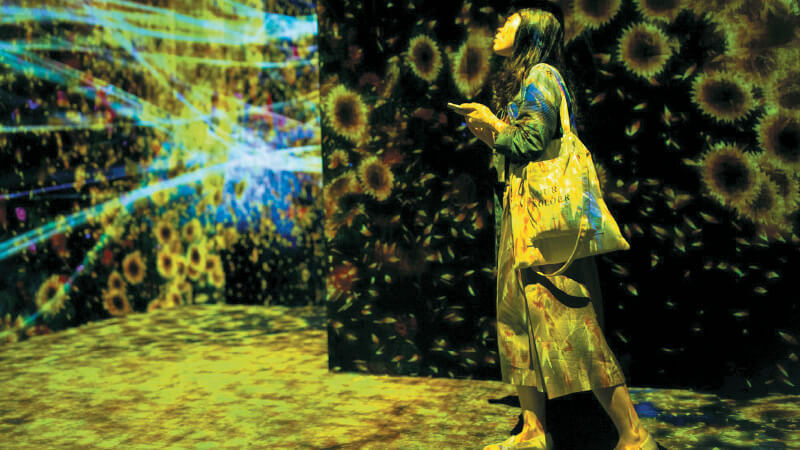 Visitors navigate a maze of dark empty rooms, stepping into or onto about 50 kaleidoscopic installations triggered by motion sensors and projected across every surface of the 100,000 sq ft exhibit space, waiting to be discovered. Without all the lights, the museum space would consist of empty halls with black walls and carpeted floors. “Each visitor can enjoy this experience in their own way,” said Ou Sugiyama, who heads the museum. “The title of the exhibit is Borderless and it is meant to signify how the immersive works keep boundaries between visitors in a state of continuous flux.” Owing to projection-mapping technology, the artworks react to movement and touch, inviting museum-goers to imagine they possess new superpowers. “With the 2020 Tokyo Olympics and Paralympics coming up, we wanted to offer the world something unique, making our city even more magnetic,” Sugiyama added. In a room called the “Forest of Lamps”, hundreds of lamps hang at different heights over a mirrored floor. When visitors enter the space, light spreads from lamp to lamp, like fire. Before you know it, the entire room becomes a single colour. With eerie music filling whatever void remains, the experience starts to feel otherworldly. If you like the ocean, visitors are invited to draw marine animals with crayons on pieces of paper, then lay them down on a scanner. Within seconds, the drawings appear on the wall and start swimming with other sea life. If you try to catch your fish, it scurries away. Other artworks explore nature and the cycle of life. Walking from one installation to another, frogs and lizards appear. One wrong step and you squash them.